In the seemingly endless bombardment of ‘human evolution’ propaganda, the latest headlines to grab attention boast: ‘Fossil connects human evolution dots’,1 and ‘Fossils fill gap in human lineage’.2 The above headlines are in response to a paper recently published in Nature3 about allegedly 4.1 to 4.2 million-years-old Australopithecus anamensis fossils. 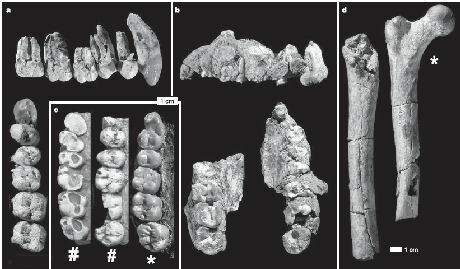 These were discovered in the Middle Awash region of Ethiopia, with the first author being well-known paleoanthropologist Tim D. White, who is associated with a series of grand claims based on scant evidence.4,5 Readers anticipating a ‘jaw-dropping’ find with the new claims will also find that the latest fossil scraps on offer will disappoint. They found a femur and some craniodental remains (pieces of skulls, and some teeth) belonging to at least eight individuals, with the finds coming from two locations about 10 km apart.6 White and colleagues claim that ‘the 4.1-million-year-old fossils were anatomically intermediate between the earlier species Ardipithecus ramidus and the later species Australopithecus afarensis, the Lucy family’.7 However, it is not so much the anatomy, but more the timing—that is, they have found something dated between Ardipithecus ramidus and Australopithecis afarensis finds, and so to them this makes the fossils by definition ‘intermediates’ between the two species. It is all based on the assumption of evolution and the alleged age-date of the fossil. It is in fact difficult to see how anyone can argue on the basis of the morphology of the fossil scraps themselves that they are a link between afarensis and ramidus. It is important to note that some evolutionists have attributed earlier finds of anamensis to the existing species afarensis,8 and the simplest explanation may be that the latest finds labelled anamensis simply represent within-species variation of afarensis. Probably the most significant find by the researchers is the Asa Issie right femoral shaft (ASI-VP-5/154), which they characterize as being morphologically similar to the left proximal femur of AL 288-1 (Lucy).9 They later refer to a character of the Asa Issie femur (the ‘minimal linea aspera’—related to the distance between ridges of the adductor attachments at the shaft’s midpoint) as being ‘on the presumably primitive end of the considerable range of variation in Au. afarensis’.10 Of course, the applicability of the word ‘primitive’ is assumed, not proved. But notice that in this statement is an admission that this bone indeed falls within the afarensis range. Nothing has emerged from this recent discovery that is inconsistent with the notion that this is just one more member of the group of extinct ape-like primates known as australopithecines, and that it is possibly even the same species as the famous ‘Lucy’. As has been demonstrated by top-level evolutionist anatomist Dr Charles Oxnard,20 the evidence has always strongly supported the idea that the australopithecines were not on any line leading to humans, even for those who accept this possibility. See ‘Lucy’ isn’t the ‘Missing Link’! Peter Line’s undergraduate major was in biophysics. After that he completed a masters degree and a Ph.D., both in the area of neuroscience. He has had a keen interest in the creation/evolution issue ever since becoming a Christian, as evolution was a stumbling block to him believing God’s Word was true. Return to top. Fossil connects human evolution dots, 12 April 2006, http://www.cnn.com/2006/TECH/science/04/12/fossil.evolution.ap/index.html, 13 April 2006. The same article (from The Associated Press), authored by Seth Borenstein, is available at: www.msnbc.msn.com/id/12286206/from/ET/, 14 April 2006. Return to text. Rincon, P., Fossils fill gap in human lineage, <http://news.bbc.co.uk/2/hi/science/nature/4900946.stm>, 12 April 2006. Return to text. White, T.D. et al., Asa Issie, Aramis and the origin of Australopithecus, Nature 440:883–889, 2006. Return to text. Batten, D., Australopithecus ramidus—‘the missing link’? Journal of Creation 8(2):129–130, 1994. Return to text. Sarfati, J., Time’s alleged ‘ape-man’ trips up (again)! Journal of Creation 15(3):7–9, 2001. Return to text. White et al., ref. 3, p. 883. Return to text. Wilford, J.N. Paleontologists Find Species With Links to 'Lucy Skeleton', 12 April 2006, www.nytimes.com/2006/04/12/science/12cnd-fossil.html?ex=1145505600&en=c257633520fcb098&ei=5065&partner=MYWAY, 14 April 2006. Return to text. Wolpoff, M.H., Paleoanthropology, Second Edition, McGraw-Hill, Boston, pp. 243, 1999. Return to text. White et al., ref. 3, p. 885. Return to text. White et al., ref. 3, p. 887. Return to text. Leakey and Walker, ref. 12, p. 63. Return to text. Leakey, M.G., Feibel, C.S., McDougall, I., Ward, C. and Walker, A., New specimens and confirmation of an early age for Australopithecus anamensis, Nature 393:62, 1998; The distal end of the humerus was discovered in 1965 and is described in: Patterson, B. and Howells, W.W., Hominid humeral fragment from early Pleistocene of Northwest Kenya, Science, 156:64–66, 1967. Return to text. Leakey et al., ref. 15, p. 62. Return to text. Richmond, B.G. and Strait, D.S., Evidence that humans evolved from a knuckle-walking ancestor, Nature, 404:382, 2000. Return to text. Line, P., Fossil evidence for alleged apemen—Part 2: non-Homo hominids, Journal of Creation 19(1):35–38, 2005. Return to text. For more information, search our site under ‘Oxnard’ as well as ‘australopithecine’ and ‘Spoor’. Return to text. • adductor muscles that ‘close’ fingers, arms, legs (in contrast to abductors that ‘open’ them). • bipedal locomotion getting around on two hind limbs, i.e. upright walking. • cranial to do with the skull. • craniodental to do with the skull and teeth. • femoral shaft the long middle part of the femur, the upper leg bone. • hominid an evolutionary term meaning humans and their fossil ancestors. The similar term hominoid means humans and their ‘ancestors’ plus great apes. • humerus the bone of the upper arm (in people) or forelimb (in animals). • linea aspera a ridge along the middle of the humerus bone. • mandible jaw bone (lower jaw). • morphology to do with the shape or form. • paratype a specimen other than the holotype specimen. The holotype is the original single specimen on which the description and name of a new species is based. • postcranial below or behind the skull. • proximal femur the top part of the femur, closest (proximal) to the body. • radius the thicker and shorter of the two bones in the forearm (or foreleg), on the same side as the thumb. • tibia one of the two bones between the knee and the ankle. • ulna the thinner and longer of the two bones in the forearm or foreleg.